This Bizarro is brought to you by Lowest Common Denominator Productions. Leaving the "Bible nut" issue aside for the moment, honestly, I completely do not get the attraction for these game shows. On the other hand, several of my coolest friends are seriously into them. (Al and Pat in Pittsburgh, Oliver in Kansas City, to name three.) Obviously, I'm missing something. Given the rising national mania for both "reality" game shows (what could be less like real life than these shows?) and NASCAR, I am beginning to feel like another species, living among humans clandestinely. Is there something cool that I'm missing about rednecks in logo-saturated jumpsuits and cars, driving in circles? I'm not saying it isn't difficult, I'm sure it is. I can barely drive more than six blocks without falling asleep and ending up in a ditch, so I'm sure I wouldn't last in 200mph, bumper-to-bumper traffic. But just because something is difficult doesn't mean I want to watch it happening. Solving Fermat's Last Theorum was difficult, but the mathematicians working on it didn't gather millions of viewers – and theme hotels, apparel shops, restaurants, posters, calendars, seat covers, toys, colognes, hygiene products, religious gifts, etc. I sometimes wonder if I'm the lunatic, that millions of Americans can't be wrong. But then millions watch Fox News and voted for Bush, so there goes that theory. I suppose a lot of people are mystified by pop culture from time to time and even more are mystified by the things that I like. If you're a big fan of these kinds of TV shows or that circular-car-driving sport, I hope you aren't offended. It's all in good fun. But seriously, stop watching Fox News – except for the camp value. I LOVE this panel, one of the rare ones I caught in the actual paper. I would SO watch this show for the train wreck it would be though. I think that is the draw in these things for people, they want to compare favorably to SOMEONE and there are few who compare unfavorably to 99% of reality stars. They can feel superior and yell at the screen about what an idiot the person is being and how much better THEY would do it if THEY were playing the game. NASCAR is all about the wrecks. All of those viewers are just waiting for flying flaming wreckage. Neither of those events are my cup of tea, but I don't rubberneck highway crashes either. I can't deny folks their good times though, whatever they may be, considering what I do for funsies. 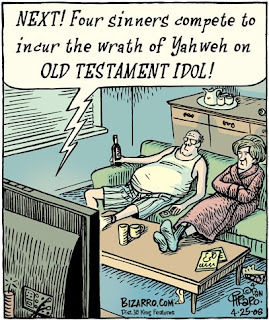 However, all that being said, as I said in an earlier comment, I think you should definitely actually produce this Old Testament Idol show for sure, I know I would watch it and I hate most reality TV. Oh, you are not alone! I often feel like Alice having arrived in a Wonderland to find the Mad Hatter is a WalMart greeter. About 11 years ago my wife convinced me we could live without cable TV, this means we get a decent dose of PBS and video rentals but that is about it. Over the years I have become anything but media savvy and (I imagine) a bit of a social hermit. Still, my friends gush about their favorite television shows and I feel compelled to at least watch an episode to better understand their appeal. After so many commercial free years of television watching I feel a little raw, over sensitive, and inevitably ask said friends, “How do you watch this stuff??”. Really, I can't see it as more that a device to watch advertising, with minor interruptions of storytelling as the meager reward. I hate NASCAR. Just recently got into big brother. Used to hate it but it is like a giant social expirement that can actually be quite entertaining. I could easily live without cable t.v. Internet, prob not. trust me, you are not missing out on ANYTHING, and are probably much better off and more intelligent because of your lack of nascar and 'reality' tv watching. In fact, Im sure of it! Reality TV like “Survivor” and “Big Brother,” define winning as rising to the top, by conspiring with your team mates or by yourself in order to “triumph.” Perhaps the appeal is that it brings out a dark, primeval sense of mankind’s survival; Kill or be killed or Eat or be eaten. If you find backstabbing your way to the top, appealing, these are the shows to watch. i concur...and i really like the photo of your three friends too. "I am beginning to feel like another species, living among humans clandestinely." I feel the same way, which is why I drew that pic!! !